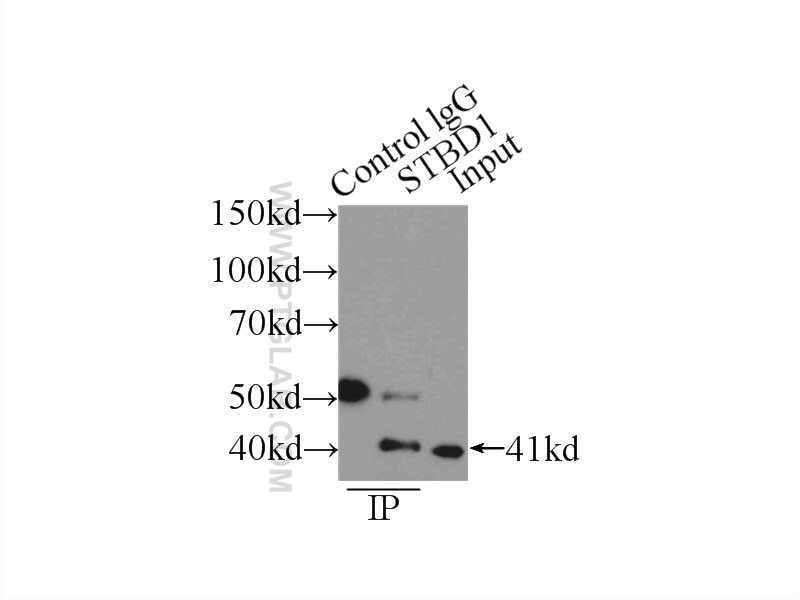 IP Result of anti-STBD1 (IP:11842-1-AP, 4ug; Detection:11842-1-AP 1:1000) with A549 cells lysate 1600ug. STBD1 may have the capability to bind to carbohydrates. It functions as a glycogen receptor that tethers glycogen to autophagic membranes for delivery and breakdown in lysosomes. STBD1 appears molecular mass of 35-38 kDa band in mouse/rat tissues and 38-43 kDa in human tissue. Mouse Stbd1 is N-myristoylated and affects ER-mitochondria association and mitochondrial morphology. Starch binding domain-containing protein 1/genethonin 1 is a novel participant in glycogen metabolism. Transgenic muscle specific Nor-1 expression regulates multiple pathways that effect adiposity, metabolism and endurance.